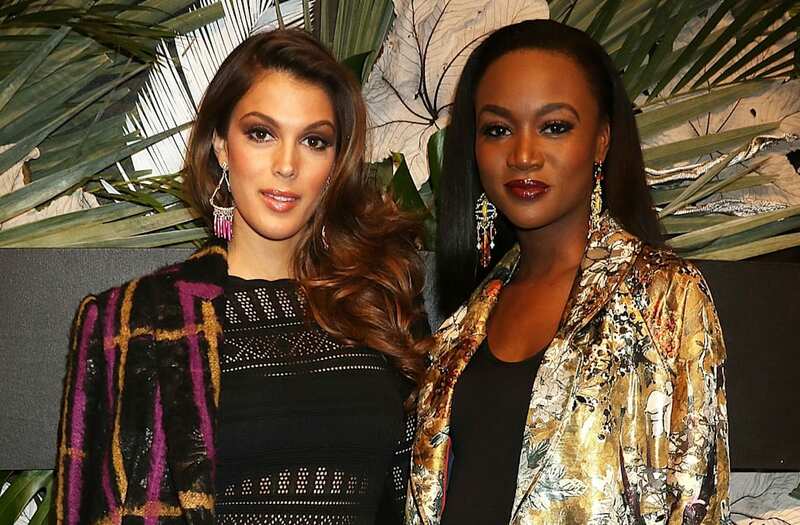 The reigning Miss USA, Deshauna Barber, and the reigning Miss Universe, Iris Mittenaere, are soaking up every moment during the biggest year of their lives. Barber, who was crowned Miss USA back in June of 2016 and finished ninth in last month's Miss Universe pageant, explained to me at the E!, IMG and Elle NYFW launch this week that both women have reached the pinnacle of the pageant world, so they're beginning to also think about what happens next. Now that Miss Universe is over, do you feel like you can take more fashion risks? Deshauna Barber: Oh, yeah! I think that when it comes to New York Fashion Week, it's literally the only opportunity for us to step out of that pageant box, in terms of being modest and making sure that what we're wearing is "pageant appropriate." So, I like New York Fashion Week because it's a chance to step out of that box. And, her being Miss Universe, she won't be competing anymore -- that's the top tier level [of pageants] -- and myself, having competed at Miss Universe and placing top nine, I'm not competing anymore either, so I can do whatever I want now. Iris Mittenaere: I like simple things, you know? So, for me, this is crazy! It's absolutely crazy because I only wear simple things. But I also really like [taking risks]. Iris Mittenaere, Miss Universe: Dior, of course! I love it -- it’s just amazing. In Paris every year I try to go, but it’s too difficult to get in! It’s a very big dream of mine. I would love to see it one day. Deshauna Barber, Miss USA: Nicole Miller! I wore Nicole Miller last September, and I was able to be there at her show, but everything she creates is literally heavenly. I love wearing her designs, and my stylist has a tendency to get a lot of Nicole Miller styles. She’s just classic, and I love the way that she mixes patterns together. Dorinda Medley, "The Real Housewives of New York": Valentino! I love Valentino, because it’s ever-changing. It stays traditional but edgy, and I love that about it. You feel like at any age you can roll with Valentino. Morgan Stewart, "Rich Kids of Beverly Hills": Stella McCartney, because I love her stuff. Wait, no! Victoria Beckham. I changed my answer, sorry! Dove Cameron, "Liv and Maddie": I’ve been a fan of Valentino since I was itty bitty, and it’s, like, my whole life! Kyle Cooke: Speedo, the swimwear company, just because I’m a big banana hammock guy. Less is more! Lauren Wirkus: I think that I would be a Mara Hoffman girl. I tend toward the more romantic, flirty side. Stassi Schroeder, "Vanderpump Rules": A lot of the designers aren’t doing it in New York anymore … should we talk about what’s going on with New York Fashion Week and how it’s not as fun as it used to be? Am I not allowed to say that? It’s just kind of disappointing that it’s no longer all in the same location -- it’s all so spread out! So, this time I’m just interested in going to new people and seeing new things. If you had to pick one designer's show to walk in, who would it be and why? Barber: Nicole Miller. I wore Nicole Miller last September, and I was able to be there at her show, but everything she creates is literally heavenly. I love wearing her designs, and my stylist has a tendency to pull a lot of Nicole Miller styles. She's just classic, and I love the way that she mixes patterns together. Mittenaere: Dior, of course! I love it -- it's just amazing. In Paris every year, I try to go but it's too difficult to get in! It's a very big dream of mine. I would love to see it one day in my life. Barber: I look forward to continuing my impact. My platform as Miss USA has been focused on our military and Post-Traumatic Stress Disorder for our soldiers, so I just look forward to spending the last four months of my reign focused on that. Then, I'm going to go into motivational speaking after this is done. Mittenaere: 2017 is my year as Miss Universe, so I think a lot of things are coming. I expect to do a lot of things with my charity, and I hope I get to meet a lot of people and travel!